POET'S VOICE (GB) (Bay 2007-Stud GB 2012, Aust. 2012). 4 wins-2 at 2-at 7f, 1m, Ascot Queen Elizabeth II S., Gr1. Half-brother to SW Gold Tiara and SW Queen's Park. Sire of 73 rnrs, 26 wnrs, inc. SW Poeta Diletto (Rome Premio Guido Berardelli, Gr.3), Voice of Love, Whitman and of Bathos, Bostar, Chastushka, Colour Me Happy, Midnight Malibu, Montsarrat, Vibrant Chords, etc. His oldest Aust.-bred progeny are 2YOs and inc My Country, Mim's Poet and of the placegetters Silent Sea, etc. Anvil Green (g. by Sebring). 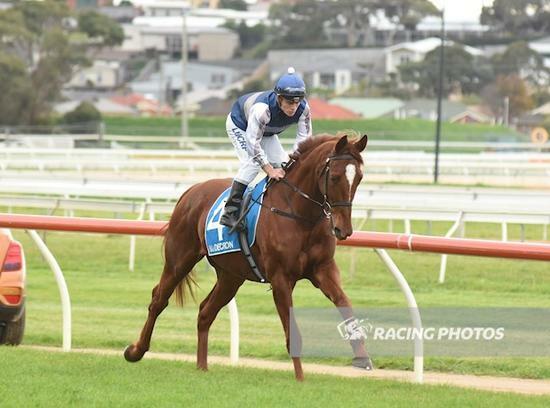 2 wins at 1400m, 1700m to 2014-15 in Aust. ZAZZMAN (Distinctly North). 8 wins from 2000m to 2800m, A$879,900, VRC Queen Elizabeth S., Gr.2, MRC Eclipse S., Gr.3, Geelong Cup, Gr.3, VRC Lavazza Long Black H., VATC Club H., VRC Vodafone H., 2d VRC Think Big H., 3d VRC Melbourne Cup, Gr.1, MRC Herbert Power S., Gr.2, Sandown Classic, Gr.2, SAJC Redbrook-Invicta Carpets H., VATC Wallace H., 4th Ballarat Cup, L.
Iris in the Glen. 5 wins. See above. TIMBER TRADER (Woodman). 3 wins at 1800m, 2450m, R711,700, Turffontein South African Derby, Gr.1, 2d Newmarket TC Sea Cottage S. Sire. Lord of the Pines (Royal Academy). 6 wins at 1400m, 1600m, A$195,060, S$375,545, VATC Adelaide FC H., Singapore TC Class 1 H.-twice, MRC Bert Bryant H., SAJC Bridgestone H., VATC Patrobas Welter H., 1600m-in track record time, 2d Singapore TC Raffles Cup, Sgp-1, Queen Elizabeth II Cup, Sgp-2, Committee's Prize, Sgp-3, Chairman's Trophy, Sgp-3, SAJC Da Costa P., L, VRC EPB Associates H., MRC Magic Ruler H., SAJC Sky Channel H., VATC Smorgon Arc P., Oakleigh Amateur FC H., Shopfitting & Building Services P., Singapore TC Benchmark 97 H., 3d SAJC National S., Gr.3, Ipswich Cup, Gr.3, Qld Tatt's RC Tattersall's Open Mile, VRC Andersen Consulting P., VATC Jayco Caravan H., 4th MVRC AAMI Vase, Gr.2, Singapore TC Kranji Mile, Sgp-2, VRC Auckland Racing Club H., L, QTC Marco Polo H., L.
Romantic Journey. 6 wins to 1250m, BTC Flight Centre H., QTC Lyndhurst Stud H., 2d BTC XXXX Gold H., 3d BTC City Pacific Finance H., Padua College H., QTC Conrad Treasury H.
Kingview. 5 wins to 1400m, A$75,080, S$199,274, AJC Kensington H., STC St Patricks Rugby Club H., BD Series H., Singapore TC Class 2 H., Benchmark 95 H., 2d Singapore TC Class 2 H.-3 times, Class 2 H., 3d AJC Peter Donnelly Motors H., Singapore TC Benchmark 90 H., Class 2 H.
BOUZY ROUGE (Snitzel). 9 wins-2 at 2-from 1000m to 1600m, A$296,555, to 2014-15, Wyong RC Mona Lisa S, L, ATC Hahn Super Dry 3.5 H., 2d AJC Plenary Group 2YO H., Sandringham 2YO H., ATC Warwick Farm H., Dubbo Cup, Clarence River JC South Grafton Cup, 4th ATC Angst S., Gr.3, Newcastle JC Tibbie S., Gr.3, Hawkesbury RC Rowley Mile H., L.
GLENVIEW (Sir Tristram). 5 wins. See above. Coach Maniac (Sir Tristram). 4 wins from 1600m to 1800m, HK$3,592,328, HKJC Dubai H., Mai Po H., 2d HKJC Fuk Loi H., Calcutta P., 3d HKJC Queen Mother's Cup, HK-2, Happy Valley Vase. WHISTLING DIXIE (Pins). 2 wins-1 at 2-at 1200m, 1600m, Manawatu RC Eulogy S., Gr.3, WRC The Edge 2YO H., 2d ARC Champagne S., L, Waikato RC It's a Message H.